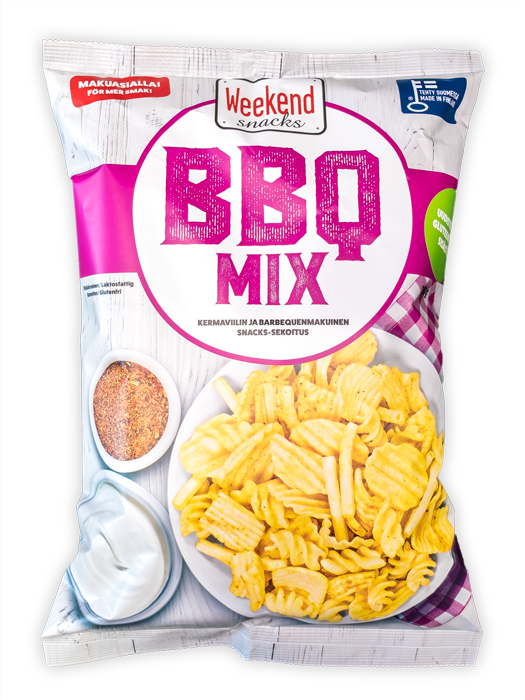 These BBQ Mix snacks were prepared in the tradition of barbeque and are good for any time or place! Try them and fall in love with the crispy sour cream and barbeque flavour. Potato flake, potato starch, rapeseed oil, flavour mix[Salt, sugar, malt dextrin, onion, yogurt powder, yeast extract, paprika, garlic, cheese powder, acidity regulator (lactic acid), spice extract(paprika), flavouring, smoke flavouring], turmeric, paprika. Total 7.2 portions per package.